Meg West is a licensed Landscape Architect with a genuine passion for sustainable living, so you might see her pedaling around town or harvesting food from her yard. She was elected to the Goleta Water District Board of Directors in 2014 and has also served on the Goleta Planning Commission. 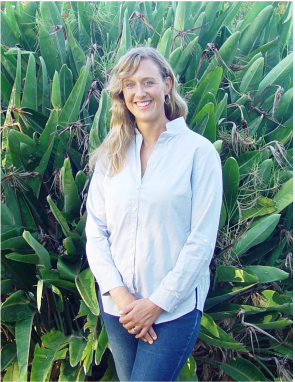 Meg was the host of Garden Wise, Santa Barbara's most informative television show on sustainable landscaping, featured on Santa Barbara City TV Channel 18 and available on You Tube. The show educates the public about water conservation in the landscape. Meg served as the designer and project manager for a variety of notable landscape projects, including the Rose Residence Sculpture Garden, the Goleta Water District Edible Demonstration Garden, and the Ocean-Friendly Garden at the Patagonia Campus in Ventura, which won a USGBC Green Award in 2013. Meg West Design has the proven ability to design and manage large-scale, complex projects, as well as help homeowners improve the aesthetics and sustainability of residential landscapes.